As you may know, naturally created diamonds are formed from carbon subjected to extreme pressure (725,000 pounds per square inch or so) and heat (1,650 to 2,370 °F) some 90-120 miles down. The world’s natural diamond supply (that has come to the surface) was formed in this way some 1-3 billion years ago. However, scientists only realized that diamonds are the crystallized form of carbon in 1772 when Antoine Lavoisier made the discovery. 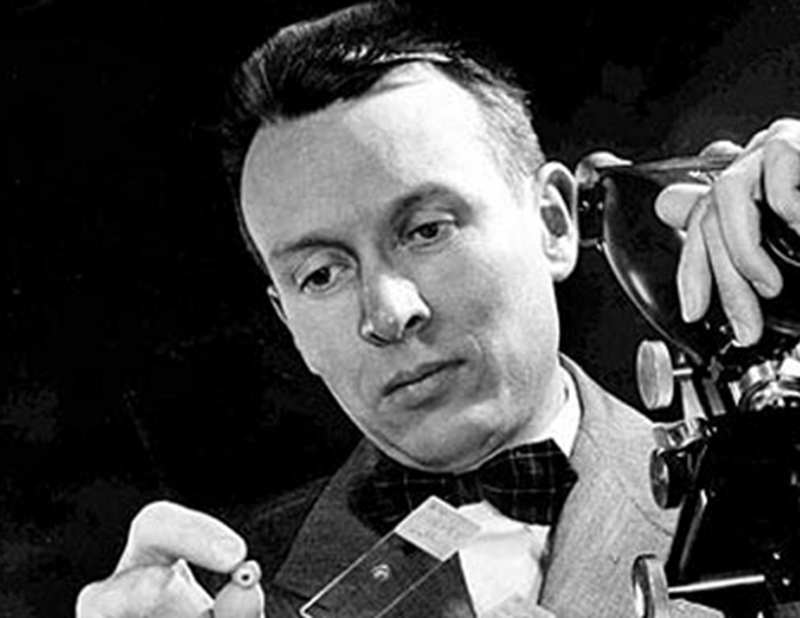 Despite work by numerous scientists in the intervening years, the first synthetic diamonds weren’t created until 1954 by one Howard Tracy Hall. Born in 1919 in Ogden, Utah, Hall grew up in nearby Marriott. His family were members of the Mormon Church and lived on a farm far enough from town that heading there for supplies meant the whole family went along for the ride. Hall and his brothers waited at the Ogden City Library for their parents to finish their business. There Hall learned about Thomas Edison and quickly became fascinated by the inventor. As a child, he reportedly vowed to one day work for Edison’s company, General Electric (GE). Hall earned an associate’s degree in 1939 and a bachelor’s degree in 1942. World War II interrupted his course of education. After enlisting in the U.S. Navy in 1944, Hall trained in radar and electronics at Harvard University. He served as an ensign until 1946 before stepping back into university courses and completing his PhD in Chemistry in 1948. Then he achieved his childhood dream: he moved across the country to work at GE’s laboratory located in Schenectady, New York. GE hired Hall to fill the role of chemist in the team for their recently launched “Project Superpressure,” a project designed to create the first synthetic diamonds. GE spent $125,000 in 1951 (approximately $1.17 million today) on a twenty-five foot tall press capable of generating 1.6 million pounds per square inch of pressure. The planned press also required GE to build a three story building specifically to house it. Two years after construction on the press began, it was finally finished and the physicists involved in the team set about running failed experiment after failed experiment with it. Hall thought GE and the team that designed the machine were approaching the problem wrong and believed there was a better, simpler way. In fact, he thought with a few modifications and a custom designed apparatus, he could use a leaky, 35 year old Watson-Stillman press to do the job. But when he approached his bosses at GE for the $1,000 he thought he needed to complete the modifications, they turned him down. After all, a team of extremely well educated physicists thought it could only be done with their shiny new, very expensive, machine. An old Watson-Stillman press could never be sufficient for the job, no matter how much he modified it. 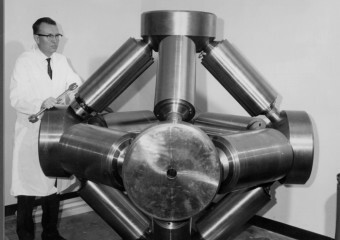 Aside from denying him the money to make the modifications, GE also gave priority in the machining shop to the physicists on the Project Superpressure team, making it so Hall could not continue working on his idea that way either. However, Hall refused to let his bosses’ disinterest and skepticism in the project stop him. He convinced a friendly machinist to help him after hours in building his newly developed “belt” apparatus. However, since the steel available in the machinist’s shop was not strong enough to handle the extreme pressure Hall needed his “belt” apparatus to handle, he again approached the GE execs. He asked them to purchase a substance called carboloy, consisting of 6% cobalt and 94% tungsten carbide. Thanks to the intervention of a sympathetic supervisor, Herman Liebhafksy, who had been integral to Hall getting the job in the first place when he insisted they needed to add a chemist to the Project Superpressure team, GE purchased the expensive carboloy for Hall. Hall performed the experiment several more times just to be sure it wasn’t a fluke, each time with the same result. He then asked his colleague, Hugh H. Woodbury, to conduct the test himself. Woodbury was a fellow GE chemist, and he successfully used Hall’s relatively cheaply built “belt” press apparatus on New Year’s Eve 1954 to create synthetic diamonds just as Hall had. When Hall informed his bosses at GE about the success he achieved with his makeshift device, they were skeptical. After all, this was a device that could be built at home in someone’s garage, with a little know-how. Their skepticism disappeared when they witnessed the experiment themselves. Hall left the building before the test specifically so that they could not claim he doctored the results somehow. After being thoroughly convinced the method was consistently repeatable, GE announced on February 14, 1955 that the company had created the world’s first synthetic diamonds. However, they initially claimed it was more of a team effort by physicists and other researchers as part of Project Superpressure, rather than it being mostly just Hall working on the project on the side and simply modifying an old press to suit his purposes. Whatever the case, this slap in the face of a bonus was the last straw. Had he been given proper credit, rather than it going to a team, with his role being highly marginalized, it is generally thought that Hall would have been inline for a Nobel Prize, among other accolades. As it was, disheartened with the way GE treated him, he wasted no time looking for other work. Being involved with the team that had managed to make synthetic diamonds was certainly a valuable thing, in and of itself, even if most didn’t know the full truth at this time. So Hall had no shortage of job offers. Rather than go work for another company, though, he instead took an offer from Brigham Young University in Utah to become a professor of chemistry and director of research. While his original intent was to continue his research on the belt apparatus, the United States government decided the invention was too important to allow that. They put a secrecy order on the apparatus and effectively prohibited him from working on it or talking about how it was made. Violation of this would mean a substantial monetary fine and imprisonment. However, getting off on a technicality didn’t sit well with some in the government and he was initially threatened with 2 years imprisonment and a $10,000 fine (about $88,000 today) for inventing this machine. Further, his new machine was likewise slapped with a gag-order. Fortunately for Dr. Hall, the government did not follow through with arresting him and ultimately lifted the secrecy order on his machines, allowing him to continue improving his designs and, finally, publish and profit from his groundbreaking work. Thanks to this, Hall went on to publish nearly 150 peer-reviewed papers and to win research grants totaling over $1 million. He even co-founded a very successful synthetic diamond company of his own called MegaDiamond, which is still around today. When it says 1 Million in paragraph 20, is it adjusted for inflation?